Last week I wrote a first piece about the new 3D environment called Hangout, on hangout.net which currently is in Private Beta. Fortunately I have received an invite for private Beta testing. 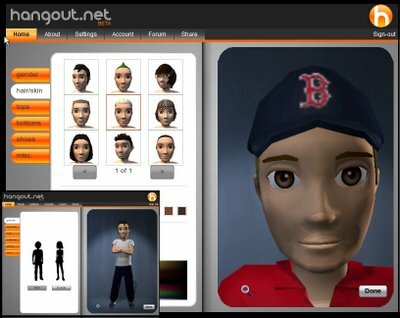 Step 1 is registering and creating your avatar. It's pretty sleek, flash based and has a limited set of options right now, so could not make an exact replica of the mighty handsome VeeJay Burns that walks Second Life, but this'll do for the time being. Step 2 is to download a 400Kb app installer to render your room. This is the amazing Unity webplayer, amazingly small, yet powerfull and full of potential. What you see now is a snapshot of my Hangout... Well, I still have a lot of decorating to do. If you want to see the real thing, you'll have to add 3D to your browser. Twones: Something new or yet another me2? It's that time of year again... No, it's not yet Christmas, but september has been a blast with the Virtual Worlds Conference & Expo, TechCrunch Top50, PICNIC 08, EmTech and one on Digital Content Distribution all in one month. No wonder one or two new and exciting startups get overlooked. 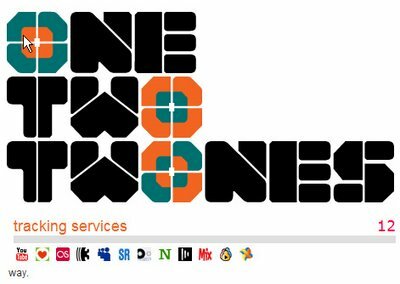 Today I came across yet another new startup: Twones, which just went into private Beta. People say it's cool, so let's have a look. Twones is a music service lets you store, organize, find & share music played all over the web (tracking many services, see image above) or on your computer (like iTunes) to one single point of access. Twones ties all music together and let's you share your taste with others in its most direct way. I'm not much of a music freak myself, well yeah, I'm an 80's fetishist, but I usually play CD's and don't listen online to music. I've tried Last.FM, it didn't bring me what I needed. So I'll pass on this one as there are enough other lifestreams and aggregators to follow, so for me, Twones is just another Me2 site whcih yet again fails to crack the code. If you are a music lover and use all sorts of media sites you might still wanna check it out. The good new is that it is yet another Dutch startup like the übercool Project E, which I blogged yesterday.